Did you sign up for the bargain of the century yesterday – Focus Ratings? They had a great day, one of their top 3 won over half the days races, that's 24 winners, including 9/1, 8/1, 8/1, 6/1, 6/1, 5/1, 5/1, 5/1, 5/1. They also hit some big forecasts including the Southwell 2.30 which paid £112.40. If you bet most days then for £10 per month these daily ratings can only improve your betting. If you'd like to be notified each time we update the Daily Punt please enter you email address below and click the Subscribe button. Every update includes at least 1 free tip. Did dutching the top 3 in those 43 races yield a profit? I don’t think that you will profit from just dutching all selections, these ratings are more a help to narrow down the contenders for making your own selections. These are deffo in the helping tool category, I don’t think that betting them all blind will show a profit. I use them to narrow down contenders for my own form study and to get me a head start with my Pacepot. 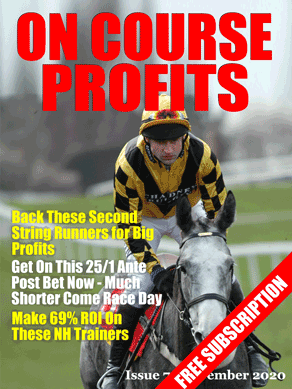 The Daily Punt is updated 6 days a week and always includes a racing tip for the day. If you would like to be notified when it is updated please enter your details in the box below & click submit.